In the 17th century the competition of merchants and nouveaux riches of the Dutch Golden Age of collecting luxury items as display for wealth was clearly present. Gifted painters catured the items, most of which were made of natural materials, in lifelike detail. Nowadays absolutely everything seems to be fashioned from plastic, because of its durability and convenience. At the same time, plastic... Read moreIn the 17th century the competition of merchants and nouveaux riches of the Dutch Golden Age of collecting luxury items as display for wealth was clearly present. Gifted painters catured the items, most of which were made of natural materials, in lifelike detail. Nowadays absolutely everything seems to be fashioned from plastic, because of its durability and convenience. At the same time, plastic is the environmental problem of the future, and it threatens both humans and animals alike. 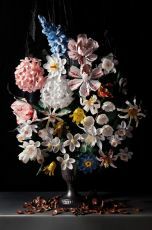 This debate inpired photographer Richard Kuiper to produce still life portraits of plastic in the manner of the 17th century. In his work a certain dichotomy is visible: on the one hand he admires platic as a material, the invention of the everlasting. 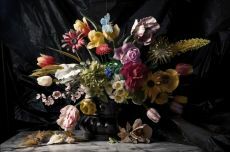 On the other hand his compositions serve as a warning, and he hopes to use his photographs to show the public it has gone overboard with use of plastic.